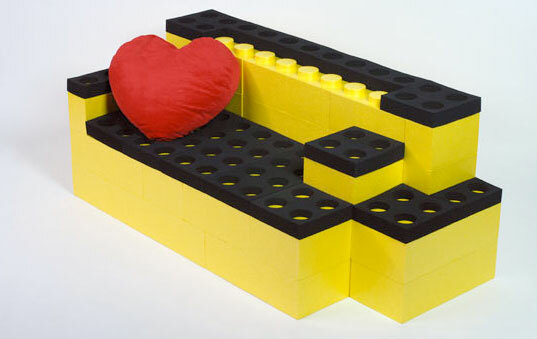 Build Your Own Furniture Out of Life-Sized Lego Pieces! 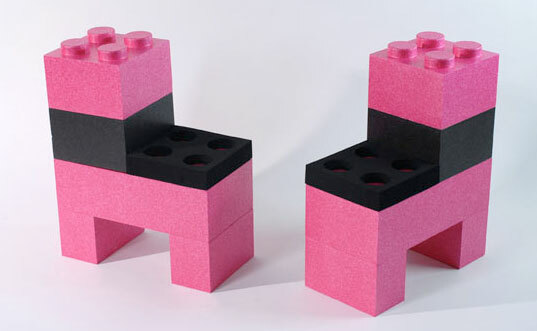 Bring out the kid in even the most serious design snob with this clever and fun DIY lego furniture! There’s no need to tediously stack thousands of Lego bricks together to construct these cushy and colorful masterpieces! Giant in size, these Lego-like Lunasoft LunaBlocks are made of expanded polypropylene, and they’re specially designed to be easily stackable, allowing DIYers to build (and reconfigure) an endless array of furniture options. The bricks are available in three sizes/materials, featuring either 2, 4, or 8 pegs, and in colors: white, black, granite, pink, green, yellow and orange — there’s a design option for every fan of playful home decor. Created by Thierry Nahon and Philippe Landecker of Lunatic Construction, these brightly colored bricks may be arranged into playful, eye-catching furniture that is as unique as your imagination. From an inviting sofa and sweet stools, to an awesome dining room table and chairs, sleek shelving unit or leggy coffee table, LunaBlocks Lego-ish bricks are sure to delight children and the kid in all of us. Feeling inspired by toy-like furniture & decor? Check out our previous coverage of a musical xylophone coffee table, LED Gummi Bear lamps, enormous Tetris blocks turned furniture, a chair comprised solely of toy blocks, and a chair made from an old playground slide! Bring out the kid in even the most serious design snob with this clever and fun DIY lego furniture! There's no need to tediously stack thousands of Lego bricks together to construct these cushy and colorful masterpieces! Giant in size, these Lego-like Lunasoft LunaBlocks are made of expanded polypropylene, and they're specially designed to be easily stackable, allowing DIYers to build (and reconfigure) an endless array of furniture options. The bricks are available in three sizes/materials, featuring either 2, 4, or 8 pegs, and in colors: white, black, granite, pink, green, yellow and orange -- there's a design option for every fan of playful home decor.